My favorite boyfriend, (the one that I married) and I just got back from an exhausting but wonderful long weekend in Los Angeles. This is purely a vacation snapshot blog post, so if that’s not your cup o tea, just come back later. If you want to travel along with us . . come on! I traveled with only one camera and one lens — my 16-35 2.8. It provides a wide and different, sometimes warped, perspective on things. Oh yeah …. and we also threw in a few phone pictures as well. We started out at the airport after driving through POURING rain to get there. 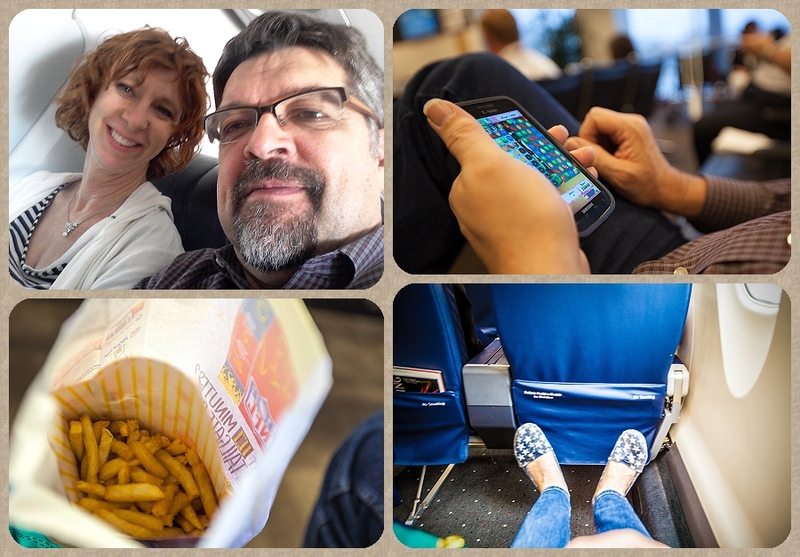 After a good breakfast at home, we launched into vacation mode with airport french fries (don’t tell our trainers) and by turning our electronic media into RELAXATION mode. It was also Mike’s birthday, and things just fell into place for us all day long — like being seated in the first row with nobody in front of us. GET A LOAD of that legroom. Miracles do happen. 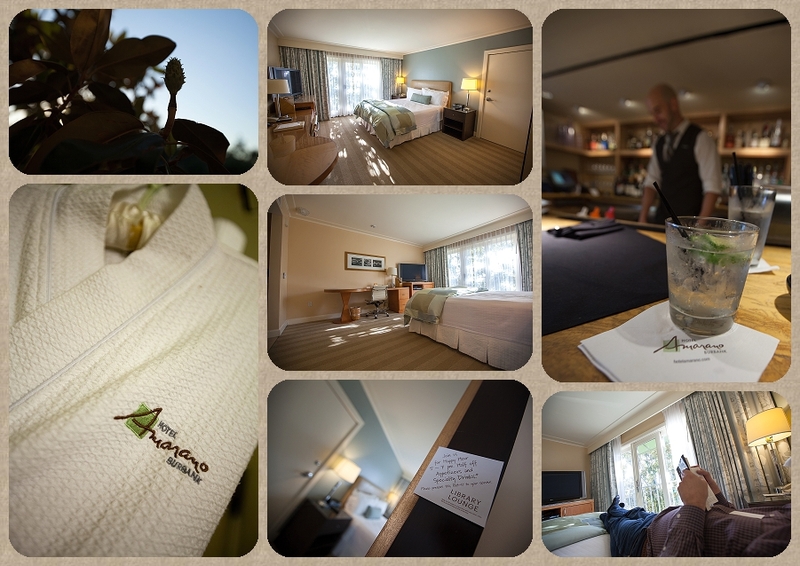 We wanted to stay someplace close to our kids, so Hotel Amarano Burbank was to be our home for the next four nights. I’m always a fan of smaller boutique hotels and this one did not disappoint — EXCEPT we don’t understand why hotels have quit putting at least one comfortable chair in the rooms. 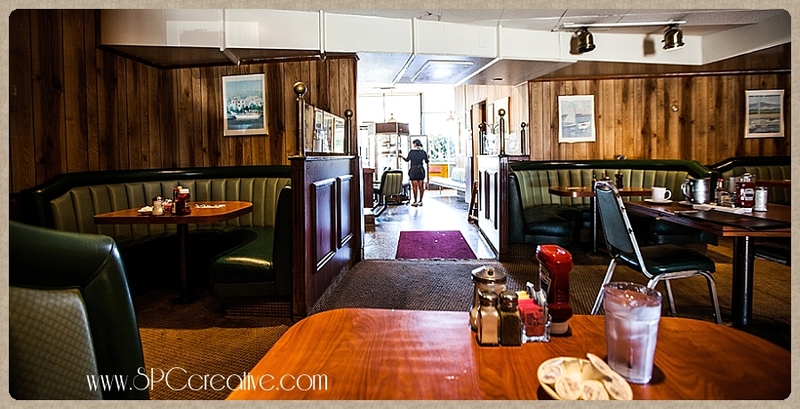 Other than the missing chair, the hotel was lovely, with waffle-weave robes and very courteous service. Our favorite person of the week though just had to be Harvey the Bartender. He’s everything you expect in a bartender. Funny and friendly, he mixed us up a couple of good stiff and very refreshing drinks then served up a delectable Ahi Tuna Poke appetizer. Before long we were ready to roll . The kids were off work and meeting us for dinner. Another thing about Harvey …. he even remembered our names the next day! Call me impressed! — oh, no …. he called me Shelly! On Friday we were on our own to play tourist, so we headed out to the Gene Autrey Museum of the West where we thoroughly enjoyed their Route 66 exhibit. walkers can make TRACKS! Still, the groups all spread out nicely, and we never felt over-run or crowded. So, the Route 66 Exhibit had plenty in store for both of us. Mike enjoyed the mapping and road construction portions — especially the collection of asphalt pavement pieces from different areas. He promptly analyzed them all to explain why they had failed. (That’s road construction talk for why the road fell apart) And I got a big charge out of all the advertising and signage. BRING ON the KITCH and COLOR! 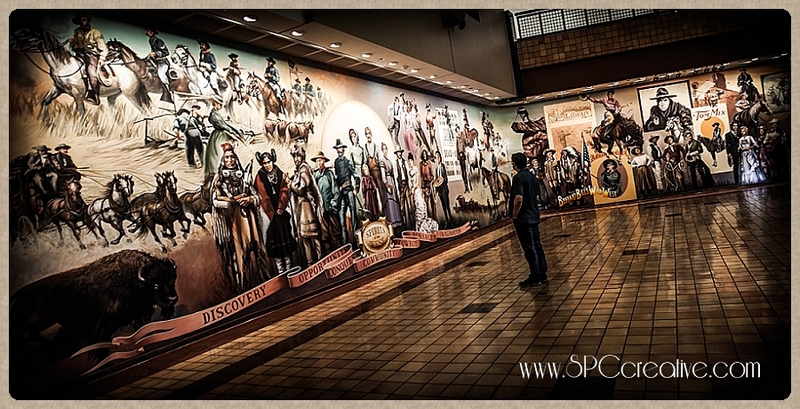 The entire museum was very well planned and entertaining, covering all things western — especially Hollywood Western! 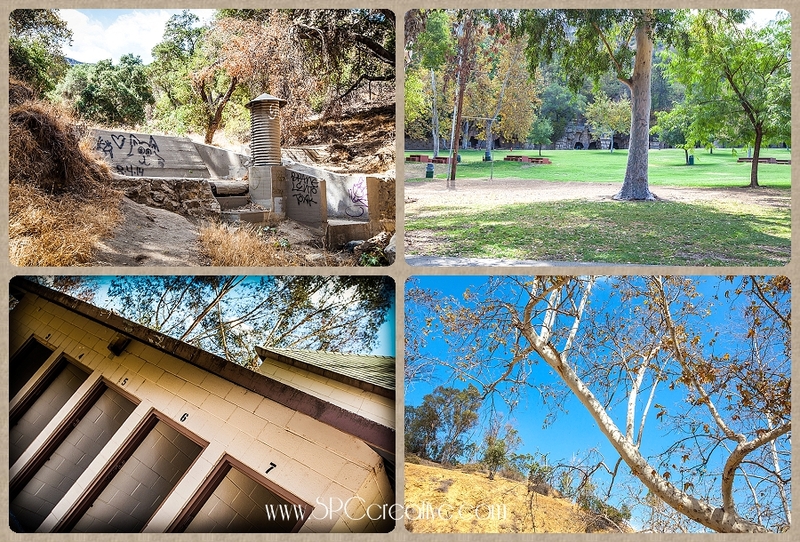 After the Autrey, I could hardly contain my excitement as we went in search of the old abandoned Los Angeles Zoo. I was wearing a sundress and flats, so was hardly equipped to crawl around on the ground or climb into some of the hidden areas like I wanted to, but exploring the old exhibition facilities was fascinating — and a little bit creepy. I couldn’t help but stay on the alert for a forgotten lion or gorilla to creep around the corner. 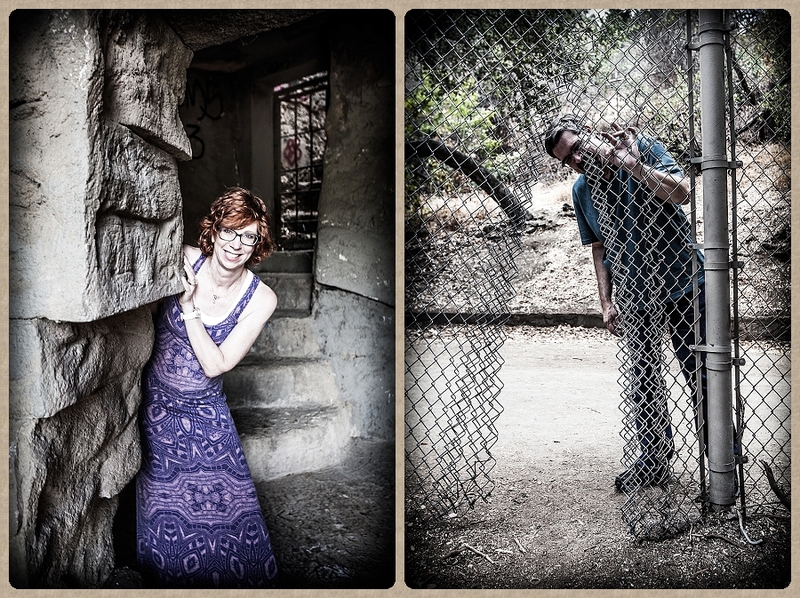 They didn’t; but we did see a deer, several squirrels, a BIG honkin’ lizard and a couple of photographer/model sessions. SOMEBODY was on the wrong side of the fence….. Hmmmmm. Wonder who? Lots of fun monkeyin’ around . . . but don’t GOOSE me when we’re taking a selfie! 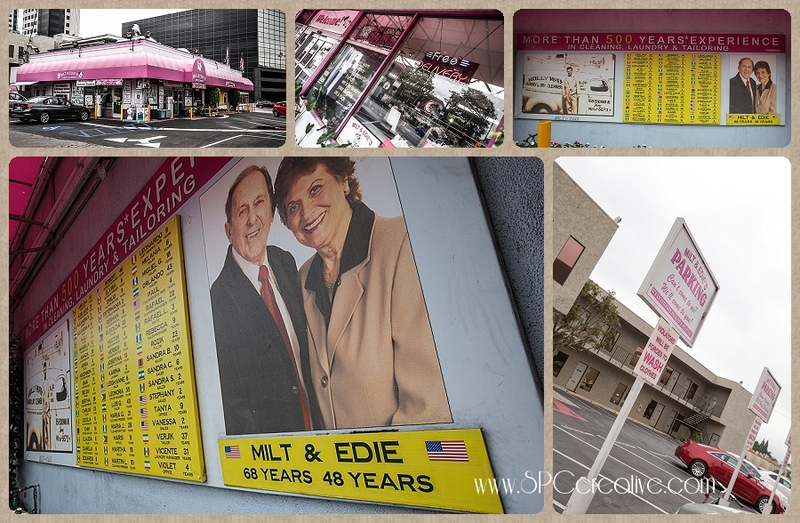 Always the tourist, I fell in love with the hot pink building and signage ot Milt & Edie’s Laundry and Dry Cleaner near our hotel. From their lighthearted approach to warnings — offenders will be forced to wash clothes — to the public acknowledgement of their entire staff with years of tenure and country of origin flags — these people must be brilliant! Just a little more local color! And a stop for Pie! Mmmmmmm Coconut Cream! The REAL reason for our trip, though, was that we are about to welcome a new daughter in love to our family, and there was no way we wanted to wait until the wedding before we could meet her parents. On Saturday morning we all drove down to Orange County where she grew up. A day of driving and eating and drinking and walking and eating and drinking and driving ……Oops….. that didn’t quite come out right — but you know what I mean. This is our Sarah with the lucky duck that she got from her grandmother’s estate. 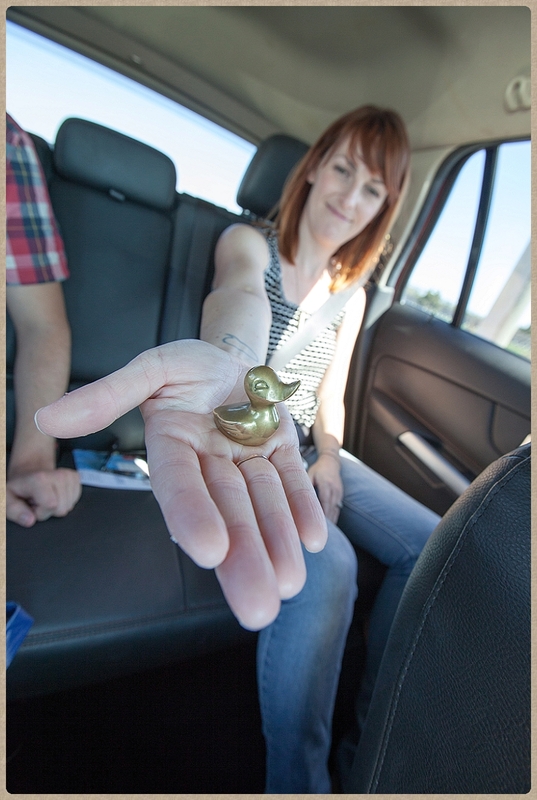 How can you NOT love a girl who carries a brass duck in her bag? She’ll fit RIGHT in! We also had a chance to visit the Newport Harbor (in the midst of the Big Boat Show) to see the boat where the nuptials will take place next spring. It just happened to be at the dock and in between events so we even got to take a little tour. That’s the galley, the reception area, and of course, the front (or maybe it’s the back) of the boat. This thing isn’t just a boat! It’s a blinkin’ 3-story floating building with glass walls. STUNNING! We also walked out to an area of beach called The Wedge . I can only imagine growing up in such a lovely place. Capping off our trip on Sunday we headed out to the Getty Museum. First…. 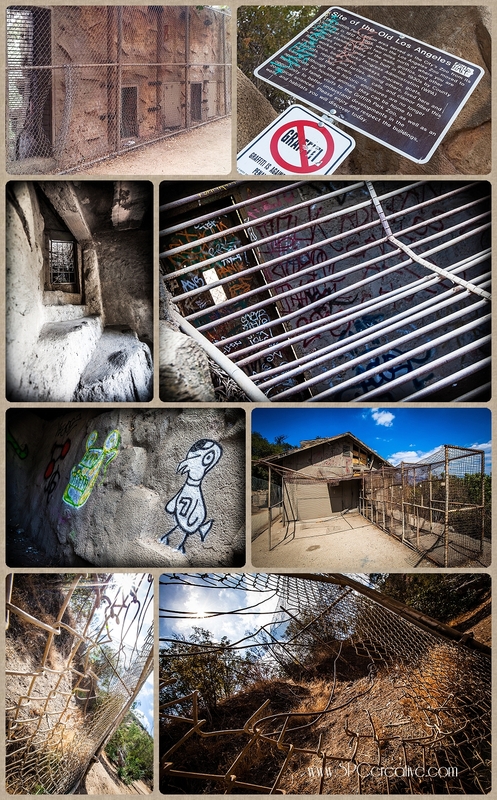 I didn’t even take my camera on this outing because I know that I would have been obnoxious. The following are all just phone pictures — mostly by Mike because I can hardly figure out how to work my phone camera. This place is not to be missed. We WILL be back! Aside from a parking fee, the entire attraction is free. After a tram ride up the mountain, the building, the gardens, the exhibits, and the views are all beyond outstanding. We took the architecture tour with a delightful docent who has been involved with the museum for 17 years, and we learned not only about the structure itself, but also about Getty’s philosophy in establishing, building, and running the museum. Surprisingly, and maybe it’s because we went early in the day, we were the only four people on the tour. Can’t beat that! So after a big lunch and an afternoon of hanging out and playing board games with the kids, it was time to return to our hotel and rest up for the trip back home.